B. Tech. in Mechanical Engineering from Biju Patnaik University of Technology, Rourkela - 2014. Working as an Assistant Professor in OP Jindal University, Raigarh (C.G), from January 2019 to till date. 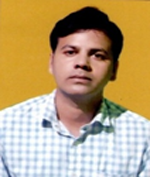 Worked as a Teaching Assistant in National Institute of Technology, Rourkela from Jul 2014 to December 2018. P.B. Kumar, C. Sahu, D.R. Parhi, “A Hybridized Regression-Adaptive Ant Colony OptimizationApproach for Navigation of Humanoids in a Cluttered Environment”, AppliedSoft Computing, 2018, 68, 565-585. P.B. Kumar, S. Mohapatra, D.R. Parhi, “An intelligent navigation of humanoid NAO inthe light of classical approach and computational intelligence”, Computer Animation& Virtual Worlds. 2018, e1858. DOI: 10.1002/cav.1858. P.B. Kumar, C. Sahu, D.R. Parhi, K.K. Pandey, A. Chhotray, “Static and Dynamic PathPlanning of Humanoids using an Advanced Regression Controller”, ScientiaIranica,2018.DOI:10.24200/SCI.2018.5064.1071. P.B. Kumar, C. Sahu, D.R. Parhi, “A Hybridized Regression-Adaptive Ant Colony OptimizationApproach for Navigation of Humanoids in a Cluttered Environment”, Archives ofControl Sciences, 2018 (Accepted). P.B. Kumar, M. Sethy, D.R. Parhi, “An Intelligent Computer Vision Integrated Regressionbased Navigation Approach for Humanoids in a Cluttered Environment”, MultimediaTools & Applications, 2018. DOI: doi.org/10.1007/s11042-018-6703-0. A. Kumar, P.B. Kumar, D.R. Parhi, “Intelligent Navigation of Humanoids in ClutteredEnvironments using Regression Analysis and Genetic Algorithm”, Arabian Journal forScience and Engineering, 2018. DOI: doi.org/10.1007/s13369-018-3157-7. D.R. Parhi, P.B. Kumar, “Smart Navigation of Humanoid Robots using DAYKUN-BIP Virtual Target Displacement and Petri-Net Strategy”, Robotica, 2018 (Accepted). C. Sahu, P.B. Kumar, D.R. Parhi, “An Intelligent Path Planning Approach for HumanoidRobotsusing Adaptive Particle Swarm Optimisation”, International Journal on ArtificialIntelligence Tools, 2018, 27(5), 1850015. C. Sahu, D.R. Parhi, P.B. Kumar, “An Approach to Optimize the Path of Humanoids usingAdaptive Ant Colony Optimization”, Journal of Bionic Engineering, 2018, 15(4), 623-635. D.R. Parhi, C. Sahu, P.B. Kumar, “Navigation of Multiple Humanoid Robots using HybridAdaptive Swarm-Adaptive Ant Colony Optimisation Technique”, Computer Animationand Virtual Worlds, 2017, 29(2), e1802. S. Sahu, P.B. Kumar, D.R. Parhi, “Design and Development of 3-Stage Determination ofDamage Location using Mamdani-Adaptive Genetic-Sugeno Model”, Journal of Theoretical and AppliedMechanics, 2017, 55(4), 1325-1339. S. Sahu, P.B. Kumar, D.R. Parhi, “Intelligent Hybrid Fuzzy Logic System for DamageDetection of Beam-Like Structural Elements”, Journal of Theoretical and Applied Mechanics, 2017, 55(2), 509-521. S. Sahu, P.B. Kumar, D.R. Parhi, “A Hybridised CSAGA Method for Damage Detection inStructural Elements”, Mechanics & Industry, 2018. (Accepted). P.B. Kumar, D.R. Parhi, “Vibrational Characterization of a Human Femur Bone and itsSignificance in the Designing of Artificial Implants”, World Journal of Engineering, 2017, 14(3), 222-226. P.B. Kumar, D.R. Parhi,“Vibrational Characteristics and Stress Analysis in a HumanFemur Bone”, Materials Today Proceedings, 2017, 4, 10084–10087. A.K. Rath, D.R. Parhi, H.C. Das, M.K. Muni, P.B. Kumar, “Analysis and use of Fuzzy Intelligent Technique for Navigation of Humanoid Robot in Obstacle Prone Zone”, DefenceTechnology, 2018. DOI: doi.org/10.1016/j.dt.2018.03.008. A.K. Rath, D.R. Parhi, H.C. Das, P.B. Kumar, “Behaviour based navigational control of humanoid robot using genetic algorithm technique in cluttered environment”, Modelling,Measurement and Control A, 2018, 91(1), 32-36. A.K. Rath, H.C. Das, D.R. Parhi, P.B. Kumar, “Application of artificial neural network for control and navigation of humanoid robot”, Journal of Mechanical Engineering andSciences, 2018, 12(2), 3529-3538. P.B. Kumar, D.R. Parhi, M. Sethy, A. Chhotray, K.K. Pandey, C. Sahu, “Humanoid Navigation: An Intelligent Computer Vision Based Approach”, The 2018 International ElectricalEngineering Congress (iEECON2018), Krabi, Thailand, 2018. A. Chhotray, D.R. Parhi, R. Kundu, P.B. Kumar, K.K. Pandey, “Modelling and StabilityAnalysis of a TWMM Using Kalman Filter and PID Controller”, The 2018 InternationalElectrical EngineeringCongress (iEECON2018), Krabi, Thailand, 2018. P.B. Kumar, M. Sethy, K.K. Pandey, A. Chhotray, D.R. Parhi, “A Sensor based ComputerVision Approach for Humanoid Navigation”, International Conference on Nanotechnology: Ideas,Innovations and Initiatives (ICN:3I-2017), IIT Roorkee, Uttarakhand, India,2017. A. Chhotray, A.S. Chouhan, K.K. Pandey, P.B. Kumar, D.R. Parhi, “Data Acquisition byMulti-rate Sensor Fusion using Kalman Filter in Two Wheeled Self Balancing Robot”, International Conference on Nanotechnology: Ideas, Innovations and Initiatives (ICN:3I-2017), IIT Roorkee, Uttarakhand,India, 2017. P.B. Kumar, C. Sahu, D.R. Parhi, K.K. Pandey, A. Chhotray, “A Hybridized RA-APSO Approach for Humanoid Navigation”, 6th Nirma University International Conference onEngineering(NUiCONE2017), Nirma University, Ahmedabad, India, 2017. D.M. Ghodki, P.B. Kumar, D. Gurung, D.R. Parhi, “Analysis of Humanoid Robot Walking.”International Conference on Frontiers in Engineering, Applied Sciences and Technology(FEAST 2017), NIT, Tiruchirappalli, Tamil Nadu, India, 2017. P.B. Kumar, A. Chhotray, K.K. Pandey, D.R. Parhi, “Investigation of Humanoid Movement using Classical Approach.” Proceedings of The 1st International and 18th ISMEConference (ISME 18), NIT Warangal, India, 2017. P.B. Kumar, K.K. Pandey, A. Chhotray, D.R. Parhi, “Kinematic Analysis of Human Movement using Multibody Formulation”, IVth International Conference on Production andIndustrial Engineering (CPIE-2016), NIT, Jalandhar, India, 2016. P.B. Kumar, C. Sahu, K.K. Pandey, A. Chhotray, D.R. Parhi, “Navigation of Multiple Humanoids using Classical Technique”, IVth International Conference on Production andIndustrial Engineering (CPIE-2016), NIT, Jalandhar, India, 2016. A. Chhotray, D. Gurung, P.B. Kumar, K.K. Pandey, D.R. Parhi, “Design and Dynamic Modelling of a Two Wheeled Mobile Manipulator Based on Kalman Filter”, IVth InternationalConference on Production and Industrial Engineering (CPIE-2016), NIT, Jalandhar, India,2016. K.K. Pandey, A. Pandey, P.B. Kumar, A. Chhotray, D.R. Parhi, “RBFNN Controlled Mobile Robot Navigation in Different Environments”, IVth International Conference onProduction and Industrial Engineering (CPIE-2016), NIT, Jalandhar, India, 2016. P.B. Kumar, A. Chhotray, D.R. Parhi, “Anatomical Characterization of a Humanoid Robot”,International Conference on Trending researches in Engineering, Science and Technology (TEST’ 16), Institute of Engineering Research, Salem, Tamilnadu, India, 2016. A. Chhotray, P.B. Kumar, D.R. Parhi, “Dynamic Modelling of a Two Wheeled MobileManipulator”, International Conference on Trending researches in Engineering, Scienceand Technology (TEST’ 16), Institute of Engineering Research, Salem, Tamilnadu, India,2016. K.K. Pandey, P.B. Kumar, A. Chhotray, D.R. Parhi, “AI Based Navigation of Mobile Robotin Unknown Environment”, International Conference on Trending researches in Engineering, Science and Technology (TEST’ 16), Institute of Engineering Research, Salem,Tamilnadu, India, 2016. P.B. Kumar, D.R. Parhi, “Vibrational Characteristics of Femur Bone”, International Congresson Computational Mechanics and Simulation (ICCMS2016), IIT Bombay, 2016. Awareness Generation on Intellectual Property Rights: NIT Rourkela 2017. Application of Robotics and Mechatronics: NIT Rourkela 2016. Application of 2D & 3D Modeling in the Field of Mechatronics and Robotics: NIT Rourkela 2016. Application of AI Techniques in Various Engineering Fields: NIT Rourkela 2016. Intellectual Property & Innovation Management in Knowledge Era: NIT Rourkela 2015.
International Conference for celebration of 63rd UNESCO Kalinga Prize for Popularization of Science: KIIT Bhubaneswar 2013. Entrepreneurship Awareness camp: CIPET Bhubaneswar 2012. Automobiles by SAE India: KIIT Bhubaneswar 2012. Passed with merit in “Business English Certificate Preliminary”. Winner of BEST position in block in “ORISSA STATE TALENT SCHOLARSHIP”. Winner of “NAVAPRATIBHA COMPETITION” of KATHA magazine for story writing. GATE-2014 qualified in Mechanical Engineering. MHRD scholarship from 2014 onwards for pursuing PhD degree at NIT Rourkela. Editorial Board Member: International Institute of Engineers. Editorial Board Member: Signal and Information Processing. Reviewer- Journal of Intelligent and Robotic Systems. Reviewer- Proceedings of the Institution of Mechanical Engineers, Part C.
Reviewer- Australian Journal of Mechanical Engineering.